When the Dallas Stars were putting together their NHL roster before this season, Mattias Janmark wasn’t on the radar. The Stars had the young forward penciled in to play for Frolunda in the Swedish Hockey League. That’s where Janmark expected to be as well. In late August, Janmark already was playing for Frolunda in the European Champions League tournament, where he had picked up three assists in four games. But Janmark would take a break from playing for Frolunda in September and head to North America to suit up for the Stars at the NHL Prospect Tournament in Traverse City, Michigan and then spend some time at Dallas’ training camp. Janmark turned heads in Traverse City, and things started to change. So, the Stars pulled out the eraser and put down Janmark as a possibility for the NHL roster. And it was off to training camp, where Janmark continued to impress. The plan was to get him a couple of preseason games. A couple turned into six. “We kept giving him more games expecting that maybe he’ll fall off. He did the opposite, he kept going and going,” Nill said. And as Janmark kept going, the Stars had a decision to make and it wasn’t a typical one. Per an agreement with Frolunda, if Janmark didn’t make the NHL team the Stars would return him to Sweden. In other words, he would not go to the Texas Stars of the AHL with the other Dallas pro prospects who just missed the cut. In the end, Janmark made the decision easy for the Stars. “He deserved to be in our top 12 forwards,” Nill said. So the trip to North America ended up taking an unexpected turn for Janmark, who was just hoping to make a good impression on Dallas and set himself up well for the future before heading back to Sweden to play for Frolunda. Instead, he found himself making the NHL and preparing for an opening night game against Pittsburgh. Janmark, of course, didn’t disappoint. He scored his first NHL goal on his first shot in his first NHL game on opening night against the Penguins. His second goal came in the second game of the season when he scored 20 seconds into the first period against Colorado. He had a four-game points streak to open the season, becoming the first player in Stars franchise history to record a point in each of his first four NHL games. He couldn’t keep up that scoring pace and went through a 17-game stretch where he picked up just two assists. But Janmark, who turned 23 last week, has found his scoring touch lately, notching three goals in the past six games. For the season, he has ten points (six goals, four assists) in 30 games. He’s been a good possession player, ranking second on the Stars with a plus-108 rating in even-strength shot attempt differential. The Stars have used Janmark throughout the lineup and in all situations. He’s played among the top six forwards and the bottom six. He’s seen some power play time and even gotten a few looks on the penalty kill. He’s played primarily wing, but there have been a few times that he’s lined up as a center, his natural position. Recently, he has found a home playing left wing to center Jason Spezza on the second line. Spezza didn't know much about Janmark before seeing him in September, but he liked what he saw immediately. Spezza sensed that Janmark had pro experience, and Janmark had plenty. He had already played 173 games in the Swedish Hockey League, one of Europe’s top pro leagues, registering 97 points (45 goals and 52 assists). In 2014-15, he ranked second on Frolunda in scoring with 36 points (13 goals, 23 assists) in 55 games. Nill knew plenty about Janmark. He was part of the Detroit scouting staff that selected Janmark in the third round (79th overall) of the 2013 NHL Draft. 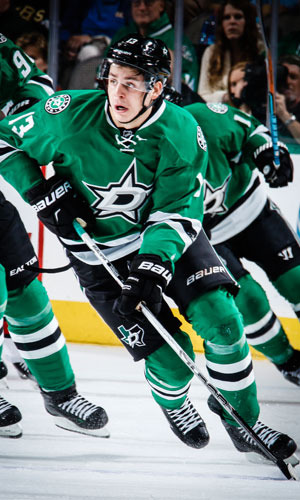 Nill acquired Janmark along with defense prospect Mattias Backman from Detroit just before the 2015 NHL trade deadline in exchange for Erik Cole and a conditional third-round pick. Among the people who sent texts to Janmark after the deal was Dallas defenseman John Klingberg, a fellow Swede. Janmark has lived with Klingberg the first part of this season while settling into the NHL and getting acclimated to living in Dallas. Now, Janmark has been getting ready to move into his own place in Dallas. Not exactly what he was expecting back in September when he thought he’d come over to North America for a couple of weeks and then had back to play in Sweden. But he’s not complaining.